The Great North Walk starts near Teralba on Lake Macquarie and finishes 175 km later at Patonga on spectacular Broken Bay. The route is primarily on foot tracks and fire-trails. Cut-off time is 36 hours for the 175 km. The course passes through rugged and spectacular terrain and is a demanding challenge for all runners. Only 40% of all starters in the 2006 event managed to finish the course, which includes more than 6,200 meters of climbing. Entrants need to cope with precipitous ascents and descents, muddy trails and creek crossings, slippery rocks and roots, and hard-to-follow trail. There are a number of sections where running is impossible. 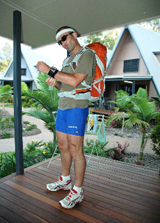 All runners need to be capable navigators and be prepared to travel at night in remote areas on difficult trail. They are also required to carry certain equipment and must carry sufficient water to last them between checkpoints which can be up to 30 km apart. The last 2 weeks of running twice daily on Magnetic Island have hopefully put me in a good shape to survive the coming weekend. Watch this space for a race update on Monday and keep your fingers crossed for me!